There are other lesser known sub-species. For instance, the screaming hairy armadillo. How would you like to run into that guy in your backyard? The pink fairy armadillo looks almost cuddly in pictures (look them up; I am not making these things up! 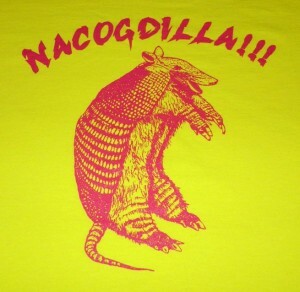 ), a sort of cross between the typical East Texas armadillo and a ground hog. While the pink fairy armadillo measures in at a diminutive six inches, and the typical East Texas variety can grow to thirty inches, including the tail, there is the ten-banded version that is colloquially called the Nacogdilla which is believed to grow up to seventy inches long and weigh in at 160 pounds. Local hunters have captured startling pictures of the Nacogdilla with night cameras. They have also captured the trail of destruction it often leaves in its wake: carcasses of deer, feral hogs, raccoons and skunks. In 2004, an area doctor with photography equipment made news when he documented on film a Nacogdilla attack on a full grown wild hog, estimated by experts to weigh in at 700 pounds. Despite some claims that the photographs were faked, local forestry authorities said that the claims were valid and reminded campers and hunters to remain vigilant, especially when using forested lands at night. In 2007, a man from the Mahl community stepped outside of his house one night, telling his wife that he had to talk to a man about a horse. Very little of his remains were discovered the next morning. Although it’s never been confirmed, many in the area believed him to be a modern-day victim of the Nacogdilla. Two photographs have surfaced of the Nacogdilla, one seemingly showing the animal raring up on its back feet and, based on measurements of trees in the photograph, estimated at standing close to six feet in height. The Nacogdilla was the subject of lore going back to the indigenous Indian tribes and is thought to have shown up at several points in area history. Scientists and anthropologists now believe an outbreak of leprosy in the early 1800s was caused by the animal. Ironically, there are tales from later, in the 1840s, of an Indian from the Shawnee Landing area who fashioned a canoe of sorts, using the armor from a seven-foot long Nacogdilla. According to tales handed down by residents, he was either called Buck Strap or Catfish Hunter and was a distant relative of Chief Bowles. Bowles, of course, made history by standing on an island in the Angelina River with six hundred Cherokees and Mexicans and declaring war on the Republic of Texas. But we’ll save that story for another time.